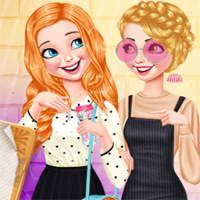 The princesses want to spend a lovely day out in the town! They want to put on a trendy and fashionable outfit and go out to the most chic coffee shop, then spend the day shopping in the local stores. Help them look shiny this day by giving the girls a complete makeover. Start the morning routine and help them brush their teeth, give them a facial cleasing and then do their hair.